Welcome to Disney Extinct Attractions. My name is Cole Geryak, and I’ll be your guide on today’s journey into the Disney Parks and some Disney Animated Classics that made their way into them. Tonight, we finally get to see Solo: A Star Wars Story. This film has been the subject of many a discussion since it was first announced, ranging from why does this film even exist to what are they going to do now that they had to change the director? Personally, I am a little nervous to see it because I am still not sure if I buy into the idea of an entire movie based around Han Solo, but I am willing to check my expectations at the door for what I hope is a fun time. 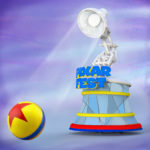 So far, it seems like the film hasn’t made a huge effect on the Disney parks. Rogue One got very little presence in the parks upon its release, and I expect we’ll see the same with Solo. On the other hand, one group of films that always makes its way into the Disney Parks is the Disney Animated Classics. Nearly all of them are integrated into the parks in some way, with that trend starting during the earliest days of Disneyland. 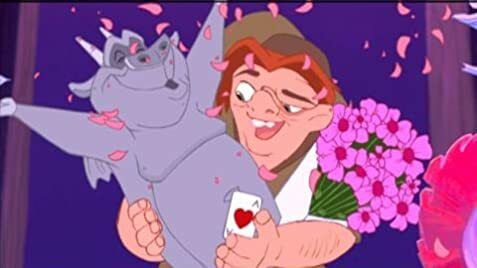 In 1996, Disney released The Hunchback of Notre Dame. This film is probably the least remembered of any of the Disney Renaissance films, but it actually had a lot of love within the Disney Parks. In addition to shows in both Disneyland and Disney’s Hollywood Studios, the movie also had a mini-parade in its honor in both Disneyland and Disneyland Paris. Known as The Hunchback of Notre Dame Procession originally before gaining the title of The Hunchback of Notre Dame Topsy-Turvy Calvacade, this micro-parade began performing in 1997. Made up of two simple floats, this parade did not seem like much, but I actually found more to love in it than you would think. The Hunchback parade actually provided a lot of fun, even though it only had two floats. They used real horses in the parade, something that you don’t often see in Disney parades. Further, they made a couple of show stops along the way to try and lengthen the amount of time that guests would be entertained. All of the costumes made the parade a lot of fun to look at, so I’m glad that they took their time. 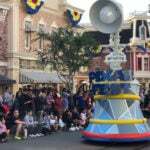 In Disneyland, you had to be lucky to stumble across the micro-parade as it would only emerge during the slowest times of the year, primarily weekdays in January. 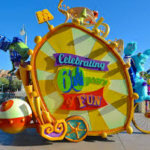 Meanwhile, during busier times, guests could see The Lion King Celebration and the Hercules Victory Parade, parades that were more emblematic of the traditional Disney parade. 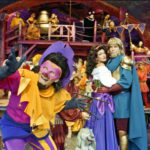 Hunchback only lasted during the slow times of 1997 and 1998, so it never really had a chance to make an impact on guests everywhere. However, across the Atlantic, the parade had a bit more life to it. 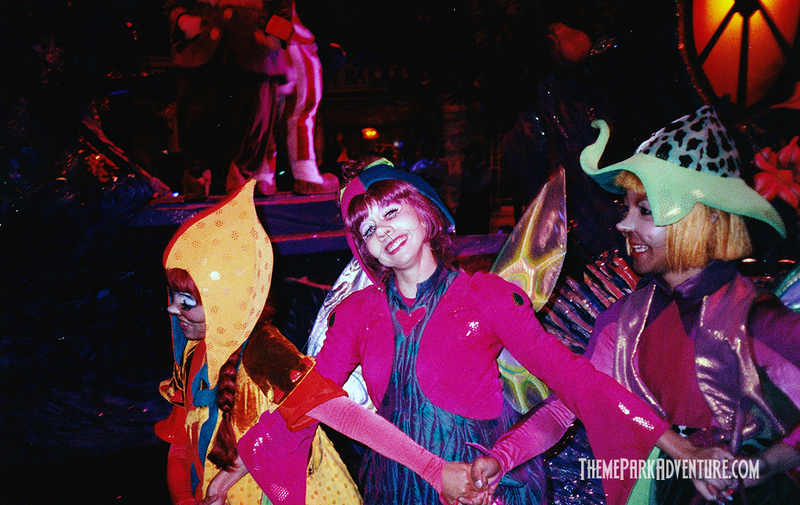 Known as the Carnival of Fools Parade in Disneyland Paris, the parade had a similar lifespan between 1996 and 1997, but it was a bit more exciting than its California counterpart. Watching the video above, the first thing that one would notice is the use of miniatures of scenes from the film. Many of them were incredibly detailed and do a great job of telling the story of the film. The Paris version was also a bit longer with a few extra floats and some show stops where kids could come out and dance with the performers. The parade felt like a combination of a show and a parade, giving it a unique flair that made it fun to watch. Overall, I liked Paris’ a bit more, but in both versions, you could tell that all the performers were having a great time in usual Disney fashion. 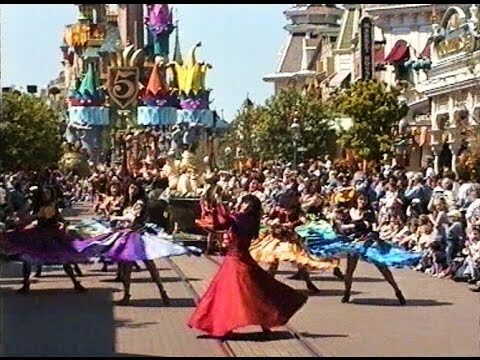 I’m surprised that we haven’t seen more mini-parades like these during slow seasons, but who knows, maybe they’ll make a comeback in the future? By 1998, Mulan had hit theaters and began resonating with audiences everywhere. With Mulan, Disney continued the trend of adapting Disney Animated Classics to parades. Mulan had a tad better showing than Hunchback, appearing in Disneyland Paris for a couple of years and Disney’s Hollywood Studios from June 19, 1998 until March 11, 2001. However, Disneyland’s version was the most extensive and included everything that the other parades had, while also adding some more fun floats. In 1997, Disneyland tried to replace the Main Street Electrical Parade with a new nighttime “parade” called Light Magic. Light Magic was an immediate failure for Disneyland, starting with its preview night where guests had to pay extra for a glorified dress rehearsal. The parade barely lasted 3 months before being sent away for good. This unfortunate failure left the park with no nighttime parade, so when the Mulan Parade joined the fun, the Disneyland brass decided to utilize it primarily as a nighttime parade. Occasionally, they would use it during the day, but during 1998, the Hercules Victory Parade would take the afternoon shift while the Mulan Parade got to celebrate the night. I really enjoyed the Mulan Parade because it was cool to see an entire nighttime parade based around one film. Generally, nighttime parades are celebrations of many different properties, so it was kind of refreshing to see this new type of nighttime parade. There were some awesome sights to see in this parade like the Shang Lai float and some very talented gymnasts. Furthermore, the giant Mushu that was a part of the parade was also fantastic looking. It must have been close to one hundred feet long, so that is quite a lot to walk through the streets of a theme park. The parade also brought a more cultural aspect to the parks by paying a lot of homage to Chinese culture. It is unfortunate that the Mulan parade is probably the least remembered of any of the nighttime parades to hit Disneyland. It was certainly better than Light Magic and had more going for it than many would have expected. But by 1999, Disneyland decided they were done with the idea of having parades specifically based around Disney Animated Classics, and the Mulan parade came to a close. Since then, we haven’t seen any parades focused on just one property, which I do think is a better move because it gives guests a chance to see more of their favorite characters. Well, that brings today’s journey to a close, so here is your look at next week’s attractions. This park was going to be located in Long Beach, CA. This park was similar in theme to Tokyo DisneySea. This park was part of the Disney Decade.